The Smashing Pumpkins are releasing a new album, Shiny and Oh So Bright, Vol. 1 / LP: No Past. No Future. No Sun., on November 16 via Martha's Music (under exclusive license to Napalm Records). Now they have shared a video for previous single "Silvery Sometimes (Ghosts)." 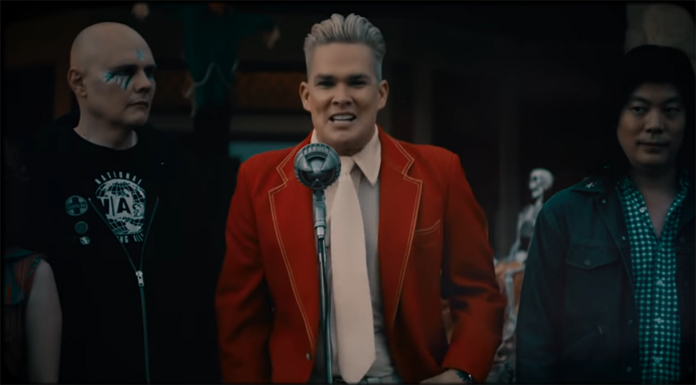 Frontman Billy Corgan and Linda Strawberry directed the Halloween-themed video, which features the band in a haunted house as part of a radio contest and guest stars Mark McGrath (of Sugar Ray) as a radio DJ. Watch it below, followed by the band's upcoming tour dates. The album includes the previously shared a new song, "Solara," which the band performed on The Tonight Show Starring Jimmy Fallon in June and for which there was also a strange video, along with "Silvery Sometimes (Ghosts)," a single shared when the album was announced. Shiny and Oh So Bright, Vol. 1 is the first Smashing Pumpkins album in 18 years to feature the three original members and was recorded at Shangri La Studios in Malibu, CA with producer Rick Rubin. Corgan has been the only constant in the band over the years, but when they formed in 1988 the lineup included Iha, Chamberlin, and Wretzsky. That lineup stayed in place until Chamberlin left the band in 1996 and then Wretzsky departed in 1999, with Iha leaving in 2000.